Were you recently arrested in Danville? Perhaps your loved one has called you in the middle of the night to let you know they need your help after an arrest. Whether it is you or someone you care about, an arrest can be extremely overwhelming. For many, when facing their first arrest, the situation brings about a lot of anxiety and uncertainty. What will happen next? What action should be taken? How can you prepare for the road ahead? Here at Affordable Bail Bonding, we are a local Danville bail bond company that cares about these fears. We are here to help you as you face the justice system and the situation you are in. Check out these five things you can expect when you are arrested and contact us night or day for help. Cooperate: Don’t try to fight the cops, flee from the cops, or resist arrest. Even if you were innocent, now is not the time to take up your defense. Calmly cooperate with the cops to prevent further trouble or harsher charges. Stay Quiet: As much as possible, keep quiet and don’t say too much. It is better to wait until you have an attorney on your side to make your case. Speaking too much can land you in more trouble than before. Remain Calm: Don’t allow your emotions to get the better of you. Refrain from yelling or making a scene. It is best to take deep breaths and face the situation with a calm attitude. Once you are arrested, the cops will take you to the local jail where you will be processed. At the jail, you will be told why you are being detained and your rights will be read. No matter how angry you are about the accusations being leveled against you, keep your cool. Upon arrival at the jail, you will go through the booking process. This is a very simple process and involves taking your photo, your fingerprints, and gathering your information. During the booking process, your personal belongings will be gathered and inventoried. These items will be held until your release. As is true with the arrest, make sure you cooperate and interact politely during booking. It is natural that you will start to feel panicked at this point in time. However, the good news is that after the booking process, a judge will be able to set a bail amount for you, which is your proverbial light at the end of the tunnel. If applicable to your situation, a judge will determine a bail amount to be paid for your release. The purpose of bail is to ensure that you do not flee the state or country prior to your court date. It acts as a guarantee of your return. The amount your bail is set at will be determined by a variety of factors. If you have no previous record, your bail amount will probably be a lower amount than if you have a criminal record. The judge will essentially assess how big of a flight risk they deem you to be and how severe your charges are before setting your bail. Once you have a bail amount set, you can call your loved ones or a bail bondsman for help. This is where our team can assist you. Whether you contact us directly or ask your loved one to give us a ring, we will get to work on posting bail on your behalf. In the meantime, you will wait for your release in jail. Finally, once bail has been posted, you are allowed to leave jail and prepare for your trial. At this point, it is wise to hire a defense attorney to help you build your case. While being arrested is undoubtedly a stressful experience, our team is here to help you through the process of posting bail. 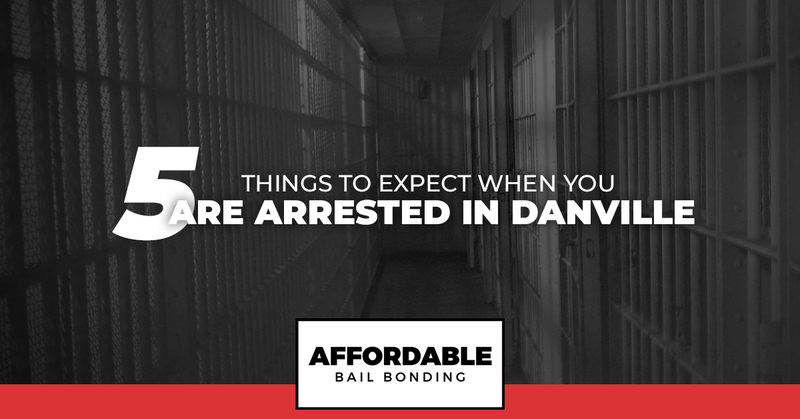 Our Danville bail bond company knows the local justice system inside and out. We can help you post bail quickly and for a price you can afford. Contact us night or day for help.